If you know every word of Robert Frost’s poem “The Road Not Taken”, then you’re likely an advocate of going against the grain. You may even envision yourself as a bit of a revolutionary. 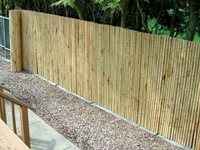 If this is the case, what are your doing with a traditional wood fence on your property? Some might say that’s pretty ho-hum. Do you eat sushi more than once a week? Are you a green tea connoisseur? Have you ever been tempted to put a Hello Kitty pillow on your bed? If cartoons aren't your thing, do you rearrange furniture according to the principles of fung shui? Are you just not the same without your daily dose of yoga? Have you ever hung paper lanterns for a party, or just because you like them? The rhinoceros is known for its strength, size and thick protective skin. Rhinos easily reach a ton or more in weight. 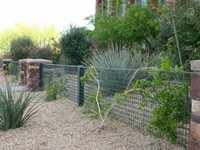 Back in 1999, a team of concrete fence manufacturers in Utah decided that there were many qualities about rhinos that applied to concrete fencing, but weight didn't need to be one of them. Have you ever built a fence? It takes a lot of hard work. 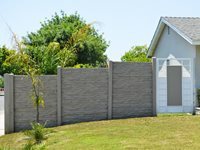 Post holes must be dug, the posts must be anchored in concrete, then the actual fencing material has to be installed. 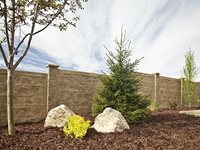 Now you can avoid this back breaking work by growing a fence. Did you know that the wise men were way ahead of their time? That's right, they brought baby Jesus eco-friendly gifts. Frankincense and myrrh, valued for their fragrance, are resins derived from tree sap. 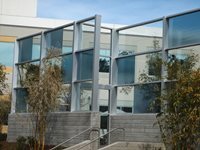 Today we use resins for many other things than delicious smelling gifts, one example is 3form's translucent resin materials. Remember the digital rain from the movie Matrix? All those green letters and symbols blurring past on the screen? 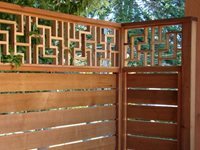 That's what I thought of when I first saw these lattice screens. Let's just hope that installing them at your home won't skew your perception of reality. 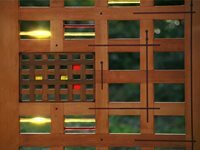 Discover how wood, tinted epoxy, acrylic rods and a teak grid are combined to create a 1950s inspired gate. If you are looking for a garden gate that serves as a focal point then this one is for you.